Well it’s been a great sailing season! We have never been so far north! We sailed almost 4 thousand miles and had a chance to fine-tune the new boat! Here is a round-up of new gear that stood out from this season of sailing! Feathering Prop - Autoprop - Last year I lamented the lack of a feathering or folding prop since I felt we lost too much speed with the big fixed 3-blade prop. So this year we changed to an Autoprop. What a difference! Getting rid of a fixed prop has to be the first thing to do to improve performance. It’s like towing around a bucket. Dollar for dollar it must be the best way to get more speed. The Autoprop automatically adjusts its pitch depending on speed through the water and seems to work quite well. Downwind Pole - Selden Carbon Pole - We have always had a downwind pole and use it to pole out one of the headsails when sailing right downwind. We hadn’t got around to installing it when the boat was new so we added it this spring. It’s a carbon pole and even though it is quite large it is easy to lift with one hand! We used it 6-7 times this summer. Mostly it was in quite light air when we might otherwise have had to motor. Nice to have it back! Anchor tackle - Rocna 33KG + 80 meters chain - Norway this summer meant some very deep anchorages. We anchored in 12-18 meters of water a few times. Yikes! It was great having long chain and knowing we would be fine. And as usual the Rocna set beautifully. It is a great all around anchor. Autopilot Remote - Raymarine Smart Remote - This is a little wireless remote to control the autopilot. It also includes a repeater for all the basic data (speed, depth, wind, heading, VMG etc). On cold or rainy days it is nice to stand up under the dodger (sprayhood) and steer with the remote. Sheryl can take it up to the bow when we are anchoring and check the depth before she drops the hook. The passage began with a beautiful afternoon departure. 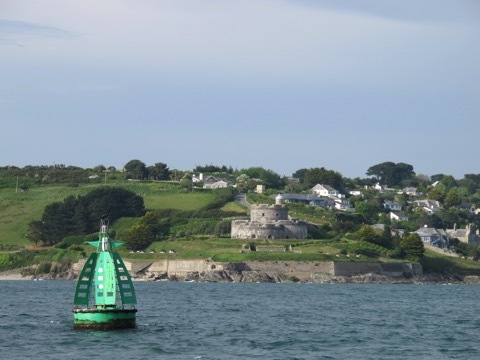 Passing the castle guarding the entrance to Falmouth harbour we pointed the bows towards France. There was a light southerly breeze and a forecast for a quiet night. 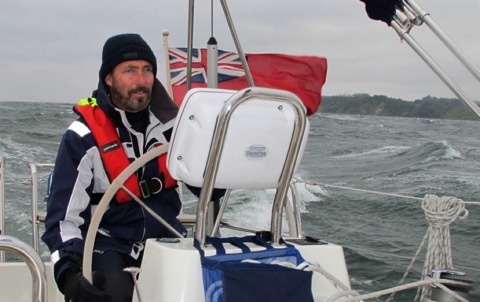 The channel crossing is around 100 miles from Falmouth to the Rade de Brest and we needed to reach the strong tides of the Chenal du Four (at the corner of France near Brest) near dawn when they would be in our favour. This means crossing one of the busiest shipping lanes in the world in the dark. Then the fog rolled in! I don’t think we have ever seen a thicker fog! We could just see the bow of the boat 40 feet away, but nothing more. Our navigation lights created pools of light in the fog and mist settled on everything. For the next 8 hours we could see nothing past our own decks. I have written before about AIS and how much we like having it. WELL!! If ever a device paid its keep it was that night. We could see every ship out there and they could see us as well. We did not have to worry about the shipping lanes. 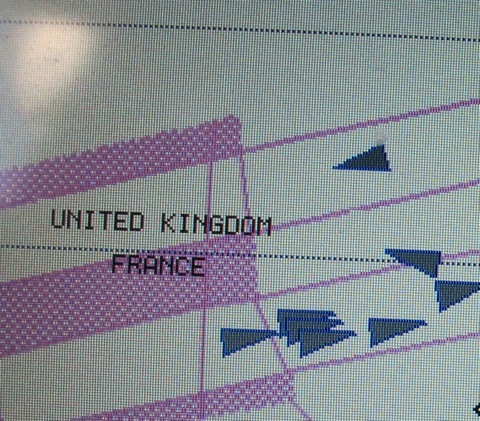 We were crossing before the start of the TSS (Traffic Separation Scheme) which directs shipping around the corner of France so were not obligated to cross at a direct right angle. However our course was at right angles anyway. And when shipping is so nice and organized it is best to cross it quickly and be away from the area as soon as possible. Of course not all boats have an AIS transponder. So our biggest worry in the thick fog is smaller boats such as fishing boats and other yachts. As we were leaving the coast there was another sailboat in sight and he DID have an AIS. But naturally there might be others. 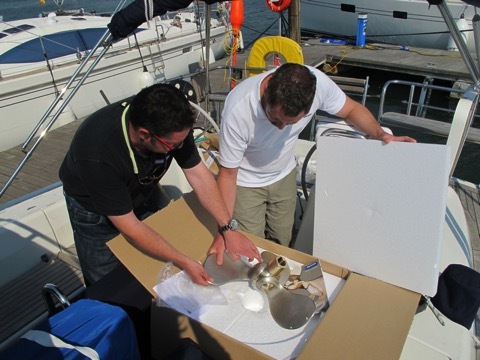 We have used the radar often in broad daylight to check how it works at picking up smaller boats. It is good to practice with the equipment. I find that we usually see a reasonable echo for small sailboats around 3 miles away. Over here in Europe most boats have a radar reflector mounted up on the mast - the most popular by far is the ones that look like a white 6 inch diameter fender. But even when I can’t see a reflector in their rigging, we usually pick up sailboats 3 miles away. Certainly 1-2 miles even small day-boats show up as a nice target. Sheryl is particularly good at reading the radar, noticing a faint target that only appears occasionally will then reappear in the same spot after a couple more rotations of the scanner. The fog lay like a heavy wool blanket over the sea. There was no moon but during Sheryl’s watch from 2200 to 0100 the fog would occasionally clear above the mast head to reveal a few stars. But still at deck level we were rolling along in a thick air, cut into precise sector slices by our nav lights. We were not yet in the shipping lanes so there were no ships during this watch. Sheryl saw two targets on radar, one crossing our bow at two miles distance. With worrying radar targets, we set a few waypoints on it’s position to mark their track. One of the targets must have been a fishing boat nearly stationary as the waypoints showed it almost still. There were also a number of larger fishing boats, thankfully all running AIS. In one case, I was just altering course to avoid it when it turned directly towards us just 2 miles away. "Distant Shores Distant Shores, This is fishing vessel Eruva. We are fishing and are just about to alter course and I will be travelling at 045 degrees. Could you give me four cables searoom astern." "Eruva, Distant Shores, roger we will alter course to pass your stern by half a mile"
What a great recommendation for the AIS technology. In fog we both could see each other clearly, and he knew our boat name to give us a call. The fog cleared by dawn and we arrived in France at Camaret! Monthly Expenses - This is the first question most people ask when trying to plan a long term cruise. What might it cost per month? The answer, as one might expect, varies dramatically! 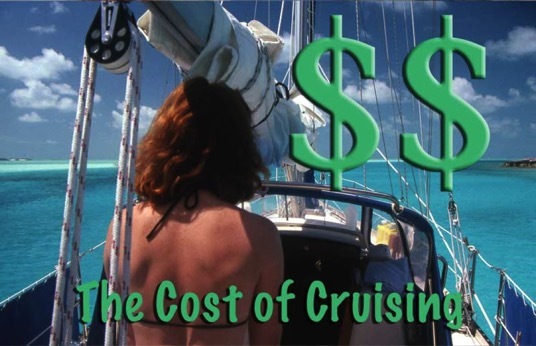 Cruising Style and Type of Boat are two factors... and then add in other more occasional expenses below. Beans and Rice cruising used to be more popular - minimal food, no marina stays, no car rentals, maintaining the boat yourself without all the options - it was possible to cruise for $500-800 - perhaps thats risen a little recently so figure $800-1000. But not many people are doing that anymore in our experience. 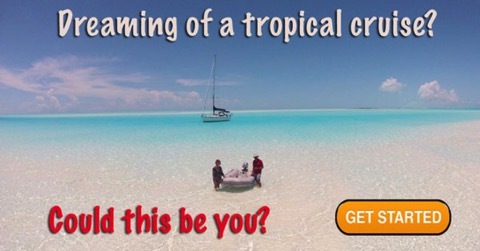 Comfortable Cruising - $1500-2500 - Rent a car occasionally, stay in marinas more often and eat ashore to get the flavour of the area you are cruising. 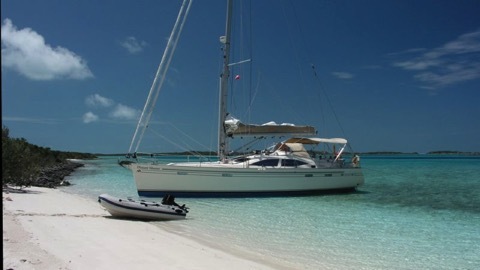 On the Move - If you are planning a fast round trip cruise it will cost more than a relaxed winter in the Bahamas. Doing an Atlantic Circle trip in 1-2 years will mean more things break and you are in unfamiliar territory more often. Similarly a quick trip down the intracoastal means you spend more than a relaxed trip when you find the more affordable options up the side creeks. Add $500/month if you are in a hurry. Pocket/Small Cruiser - 25-32 foot - We don’t see many cruisers less than 32 feet on extended cruising these days. But if they are they can be doing it for less money. But it is not a good idea to try to cram all the available upgrades on a small boat. 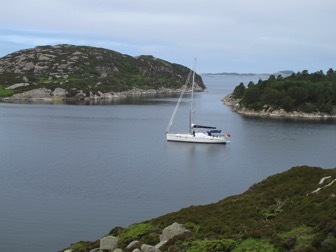 We have seen 30 footers with davits, air-con, large dinghy and outboards and stern arches. A small boat can be seriously overloaded and might be dangerous at sea. 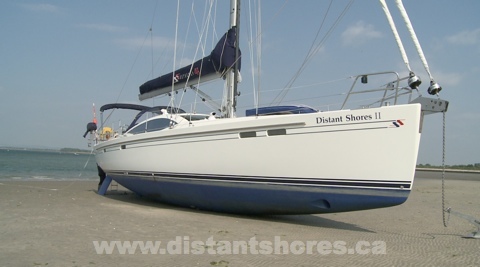 But a small sailboat is the least expensive option and can be a very seaworthy and fun way to get out cruising. Less time/money spent on maintenance if you keep it simple! Mid-size Cruiser - 35-42 - most popular size cruiser. By the time you get to 42 feet the budget for fuel and maintenance is getting higher but the boat is well able to handle a couple in relative comfort. There is room to store what you need and most 42 footers can handle a dinghy on a stern arch, upgraded battery capacity etc. Add $300-400/month for DIY maintenance - more to have someone do the work for you. Larger Cruiser - 44-54 foot - this is the limit for most cruisers we see out there. Budget for dockage, fuel and maintenance is naturally higher than the smaller boats. In the Caribbean the 50 footer is more common than here in Europe but you don’t need to go to the dock that often - and dockage can be a very expensive budget item. Add $400-600 to the monthly budget above for the larger boat. Catamaran - Cats in the 38-45 foot range are similar to the Large Cruiser - dockage and repairs will be in the same range as well as the interior space being similar. A 45 foot cat is a BIG boat. It has 2 engines to maintain and is usually charged 50% more for dockage than a 45 foot monohull. Rigging, sails, engine repairs, a new outboard, a new dinghy... these are all in the occasional category and can be hard to budget. When you have a new boat, most of these items will not appear in the budget for a few years, but if you have an older boat you might well be facing a major repair in the short term. Most dramatic might be new standing rigging or a new engine, either could be around $10K depending on the boat. These are the most difficult to predict but a good survey before heading out on a major cruise could be a good investment. But for boats over 10-15 years old it would be good to budget in perhaps $5000-8000 per year for bigger repairs/upgrades. Boats larger than 40 feet will naturally have larger budgets for these things. 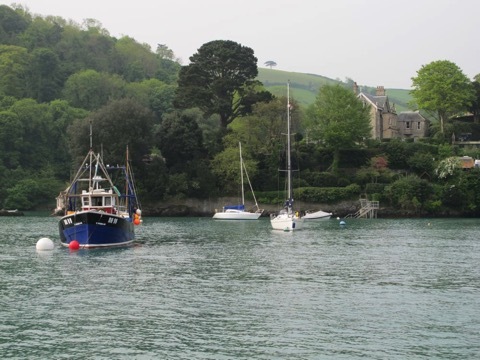 We have just completed the first leg of our journey this year - starting in Chichester and sailing down to Falmouth. It was a good example of connecting the dots.... making a quick passage with the aid of a long waterline! 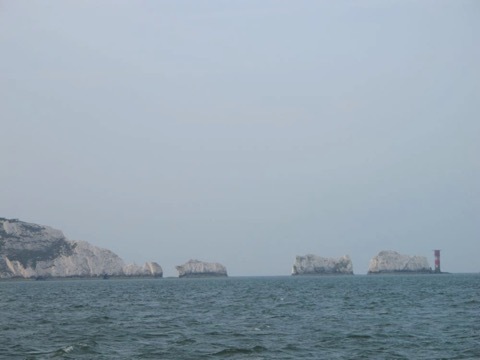 We did three hops - a short 25 mile jump on Wednesday afternoon through the Solent to Lymington. Since it was the first sail of the season we wanted to take it easy and check things over. I had forgotten to rig the tack end of the reef points but otherwise we were fine. It was also the first time we set our new carbon downwind pole. That was a great success as we had a tail wind most of the way. We flew past the other yachts out there who were trying to jibe downwind. 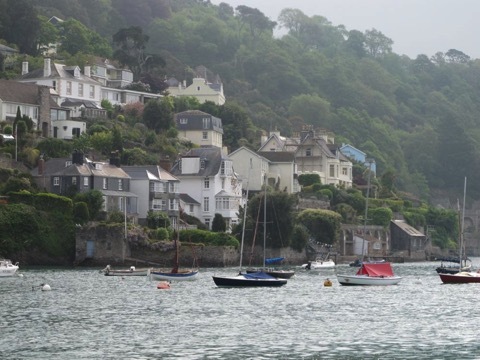 Thursday we had a broad reach from Lymington on to Dartmouth. Again we passed other boats out there averaging 7 knots with apparent of only 10-11 aft of the beam. Here we had another example of the advantage of a long waterline as there was a a mix of seas and 2-meter swell almost on the bow. In any given circumstance, a longer waterline will usually result in a smoother ride. In this case we could hold our speed and course more easily as our sails stayed full and drawing in the rougher patches. Passing other smaller boats (32-40 feet LOA) we had a smoother ride and seemed to keep our speed when they might roll too much and have their sails collapse. The passage to Dartmouth from Lymington was 92 miles. We got under way at 6 and got in before 7. This allowed us to get going after dawn and get in before dark. In our days sailing Two-Step we would never dream of a 90 mile run like that. Planning 5.5-6 knots connects your destinations much differently than at 7-7.5 knots. 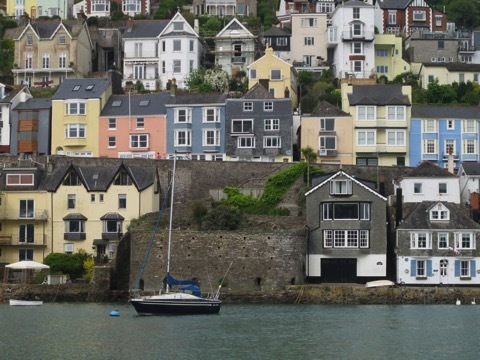 Here are a few pix of Dartmouth - a very pretty port town. We put the boat up on the beach yesterday to change the prop. Its been gorgeous weather since we arrived here last week. Its now neap tides so the total tide is just 2.2 meters. 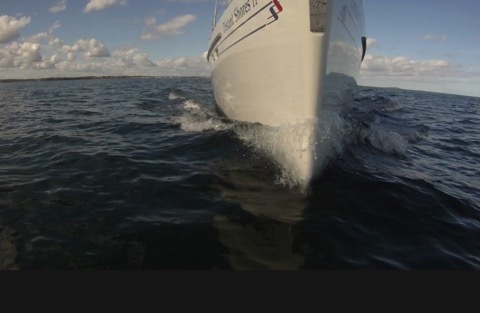 Our boat draws 0.9 meters with the keel up. This means we have to get on the beach near high tide so we will have a few hours after the water has fallen by the 1 meter we need to dry out. We dropped our Fortress anchor as we came in so we would be able to pull back off after, and nosed up on the sand. You can see the sand is quite hard - our skeg has just sunk in to the sand by about 4 inches. New prop in place! Its an Autoprop and we’ll see how she performs over the season’s cruise. The Autoprop is made by Bruntons in the UK. It is unique amongst propellors in that its blades find their own proper pitch depending on the situation. I am still a little fizzy on the actual science of this, but I understand the blade is offset from the hub (as you see above) and this allows it to rotate to accommodate the speed of water flowing past. If you are going slower (punching into a head sea or strong wind) then the pitch will be finer. 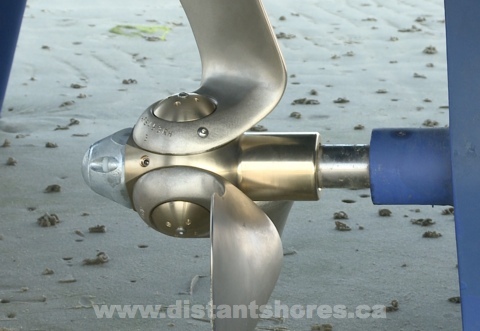 If you are moving faster such as motor sailing - then the blades will take a much coarser pitch to match that. We’re back on board in Itchenor (South of England) getting ready for this year’s cruise. Weather is lovely - like summer actually as its 24 degrees and sunny, flowers blooming etc. Its even a holiday weekend! 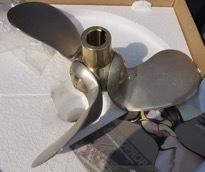 New Propellor - we sailed last year with a standard 3 bladed fixed propellor and really felt the drag. It is like towing a 20 inch diameter bucket around. We have a shiny new Autoprop this year and are anxious to test it out. Here David of Bruntons (who make the Autoprop) shows me how the bladed rotate to automatically find the correct pitch. 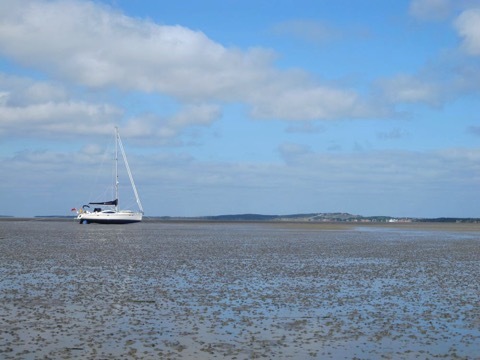 What do you do if your boat washes up on the beach? Storm winds come up from the wrong direction and your anchorage becomes a lee shore. Then your anchor lets go and your boat is washed up on the beach!!! This happened in an anchorage in the Balearic Islands a few years ago - thankfully not to us. We had been keeping a close eye on the weather and had left the anchorage before the storms approach. When we came back to the anchorage there was a boat up on the beach where the storm had thrown her. She drew more than 5 feet and you could walk all around her without getting your knees wet! She was well up the beach and after trying a number of ideas it was impossible to pull her back to sea. Winching, pulling, a line to the masthead to lean her? No Way! She was well and truly planted as the sand had reformed around her keels (she had twin bilge keels) and she was sitting in perhaps 6 inches of water with her keels down three feet in the sand. It turned out the solution was to use a couple of small outboard engines?!? Starting by digging a small hole in the ankle deep water - the small dinghy outboard could be run as a fan blowing sand out to make a wading pool than a larger and larger pool. After a couple of hours there is room to move in a more powerful outboard. More and more water flowed back into the pools until finally the yacht was nearly floating in her own swimming pool. Incredible that a small engine could move what must have been 100 tons of sand. It did require a bit of TLC afterwards!! We filmed this exercise and it is included in the first season of Distant Shores on DVD the episode is also available for digital download here on Vimeo. These days we find ourselves ever more dependant on the internet - and going into withdrawal when we can’t get connected. WiFi has been quite useful the last 6-7 years but is still limited in range; usually in marinas or popular anchorages. But for wider access the only real options have been satellite ($$$$) or mobile phone data plans. We have been using mobile data plans for a few years now and it is definitely our preferred way to be on the net. Here is a quick summary of how we got on line the last couple of years. USA - we used T-Mobile and had good data access all along our trip in 2007-2008-2009. It was $40 per month for 5GB I think. Excellent!!! Since the typical cruise in the USA is for at least a few months it makes sense to sign up for something like this. Caribbean - difficult. Since we were in different islands for just a few days or a few weeks it wasn’t practical to do mobile data. Bahamas - no data plan available when we were last there. Pity. I think Blackberry users are in luck though. Netherlands - OK - We got a stick here too. (but see MiFi below - it would have meant just buying a data sim instead of a new stick) It was not very good value MB per Euro. But I think this is always improving and changing. We were in touch everywhere in Holland during both cruises there in 2010. So that was good - just pricier than we had become used too. Denmark - NO - they wouldn’t let us have a data access without having a bank account in Denmark. Hopefully this will change. Sweden - YES - Comviq - excellent data plan - 5GB data for reasonable rates. We were online in even remotest locations during our whole cruise. Summary. We will continue to use data plans to get online whenever we can. No more worries about wifi access. Also no worries about wifi security (see discussions on firesheep at Panbo). More and more countries have this available and this is good news for sailors! 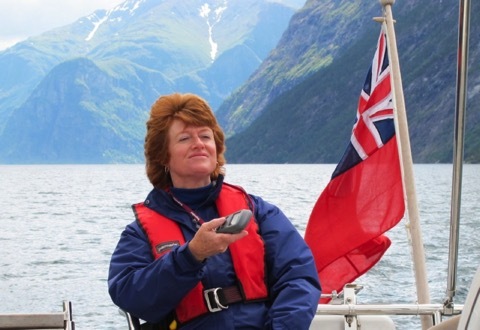 Mifi - We were introduced to this excellent gadget by a Dutch sailor. It allows you to share a data connection so you only need one data sim when you come to a new country and all your data devices can connect. Its about the size of a deck of cards. 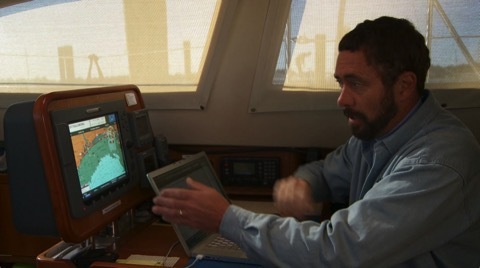 We sat it in the middle of the boat and got online from both laptops wherever they were in the saloon. Cruising with the Internet has never been better and easier!!!! We were even online out here! It was good to be able to check the weather! Navigating safely has been getting better and easier. Recently we got an iPad with GPS and Navionics charts and I’m looking forward to trying it out on the upcoming cruise. 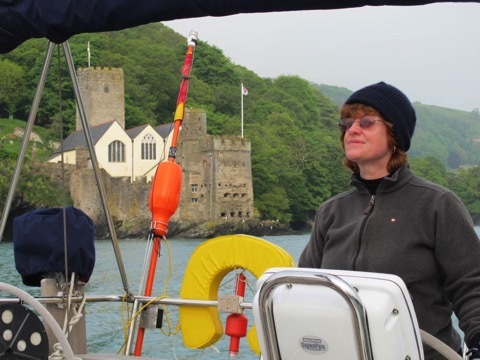 Last year’s cruise with the new boat we had two new instruments to make navigation easier. The Raymarine E90Wide plotters were great! We have one right at the helm in a pod, and the other up under the dodger (sprayhood) as we use that position at sea. These plotters are a hybrid using touch screen but also have buttons. I loved the buttons and used them most of the time but on rainiest days sometimes switched to the buttons. Often we found ourselves using both. Buttons are convenient for zooming, and then dragging the screen to a new position. Nice! 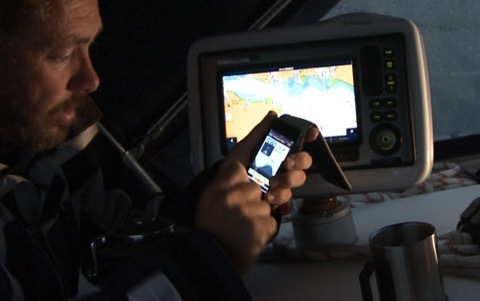 As a fun test I got the Navionics App for my iPod last spring. So we have had a full season cruising and have got to recommend them! We got the Apps for UK/Holland and found it a great tool. 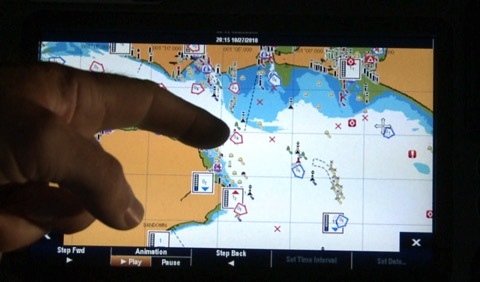 It has the tides as well as the full charts for the area and I often found myself using the App to plan our departure times and course - especially in the trickier tides of the Channel Islands. The screen is too small for use with serious navigating but it still had one interesting use. Because it is so small and I always carry my iPod around, I often found myself using the charts when comparing notes with other cruisers. We might be meeting up on someones boat and discussing upcoming destinations. I could pull out my iPod and put on a recommended waypoint or anchorage. Very cool!! Now we have an iPad I have added the Apps for it too (available in HD for the bigger screen). It will be fun to try this out on the next cruise! I am certain it will it will be a useful addition to our navigation equipment.